Applications - damp and salt affected walls, chimney stack and chimney gable wall priming prior to rendering or repointing, to help bond old with new mortars. Ultra powerful acrylic additive for sand and cement mortars, for use when repairing or patching walls, joints and concrete. Used in concentrated form to make waterproof mortars and brushed directly onto masonry as a primer. Primer and waterproofer for sand and cement. Usage rate - allow 1 litre to make 6.6 litres of sand and cement repair mortar. Lifetime - 20 years plus, subject to the wall material and condition. Why its Special - not affected by chimney salts, resins or new pointing. Applications - replastering using sand and cement, after the insertion of a chemical damp proof course, chimney stack and chimney gable walls render and pointing mix additive. Waterproofs, plasticises and salt inhibits sand and cement renders. Can be used as part of repointing joints that have become soft and loose, in brick, block or stone walls. For replastering with render, where walls have been damp or 'salty' or replastering after the insertion of a chemical damp proof course. Concentrate to be mixed 40:1 with water in a sand and cement mix at 3:1 by volume, using dry, washed plastering or concreting sand. 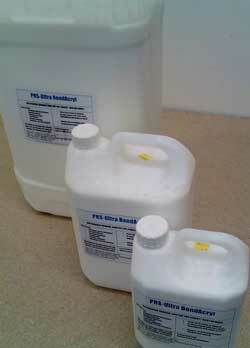 Usage rate - allow 1 litre of concentrate per 4 square metres of render at 25mm (1 inch) thickness. A 5 litre bottle will allow for up to 20 square metres of render 25mm thick. Applications - damp and salty wall treatment, chimney stack, chimney breast and chimney alcove internal and external Neutraliser to kill 'salts' in bricks, stones and joints. Used on chimney breasts, alcoves and returns to kill 'salts' in walls. Can be used on bare masonry, bare render or bare plaster - but, will not penetrate paint. Usage rate - apply with a brush at a rate of 5 - 10 square metres per litre, depending on the roughness of the surface, twice. Damp the wall with fresh water before each coat. A 5 litre bottle should cover at least 12.5 square metres with two coats. Lifetime - 5 years plus, subject to the wall material and condition. Why its Special - neutralises chimney salts, to reduce the risk of damage to new pointing or rendering. Applications - damp and salt affected walls, chimney gable walls, chimney breasts and chimney alcove walls, internally and externally. Dimpled plastic sheet, which provides an insulating air gap. For fixing to damp or salty walls onto bare masonry or bare render, but not over Gypsum based Plaster. Indoors, the Mesh surface can be either directly plastered with Bonding or covered with Plasterboard on dabs of adhesive. Outdoor, the Mesh must be rendered with sand and cement. Part Rolls - yes, unlike most Competitors, we will cut lengths off rolls (1 metre or 2 metres wide) and supply part boxes of plugs. 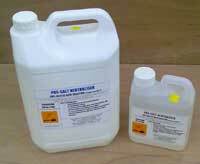 Why its Special - not affected by chimney salts, resins or new pointing. Provides an insulating air gap and isolates the wall form rainwater, whilst allowing it to breathe. Call us for free advice to help you choose the correct Membrane for your job. Free Help - 01626 331351. Applications - to check all walls and timbers, plus chimney stack and chimney gable wall testing, indoors. Follow the path of dampness readings to help isolate the cause(s) and source. 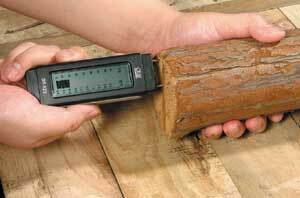 Professional Damp Meter with Timber and Masonry digital scales, battery and calibration test facilities. Tip - ask for our FREE guide Data Sheet which describes how to use Damp Meters and explains the meaning of common patterns of readings. Ring Angela or David for Free Help on 01626 331351. For more Meters Click Here.